Innovation is often associated with invention. While the two are related, you don’t have to invent something to be innovative. Your employees know your business and your customers. Create a platform that will encourage them to generate ideas that will satisfy the needs of your customers and grow the business. Bottom-up Innovation program engages employees to go above and beyond to generate ideas that will increase customer satisfaction, create operational efficiencies and help transform products into what customers want. What do Toyota and Google have in common? An all-inclusive “culture of innovation,” in which every employee is responsible for coming up with ideas to make the company more successful. Do you want your employees to be responsible for innovation as well? Do you believe that is possible? It absolutely is possible, and in The Bright Idea Box, technology executive and corporate consultant, Jag Randhawa, will show you how. 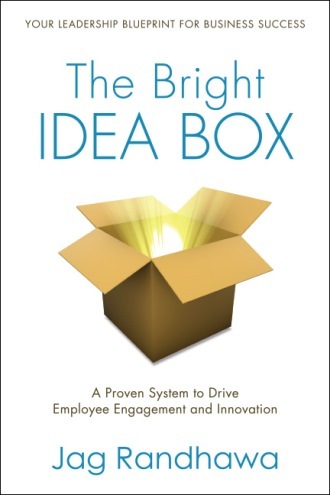 Begin to make it happen by reading The Bright Idea Box.